In stock -This product will ship today if ordered within the next 9 hours and 58 minutes. Kingfisher Children`s Strawberry Toothpaste is a gentle non abrasive formula made with real strawberries for flavour, keeping little teeth and gums healthy. Calcium Carbonate, Glycerin (Vegetable), Aqua (Purified Water), Sodium Lauroyl Sarcosinate (Palm Oil), Hydrated Silica, Cellulose Gum, Aroma (Strawberry), Foeniculum Vulgare (Fennel). 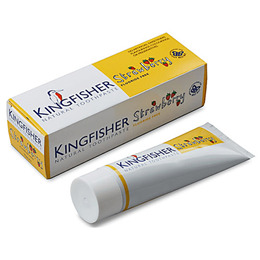 Below are reviews of Kingfisher Children`s Strawberry Toothpaste - 75ml by bodykind customers. If you have tried this product we'd love to hear what you think so please leave a review. I've bought this product for my daughter for at least a year sourcing the cheapest on the internet. I came across Bodykind by chance and am so pleased with the professional and efficient service I've received. As well as the product I will certainly be recommending Bodykind.